My premise is that we need a new Model for Housing, as the older homes will not hold their value by today's Renewable Energy standards, and the next generation buyers will quickly be drawn to a more energy efficient model. These new buyers are also looking for different designs than older homes typically offer for their lifestyle choices. While researching this article to learn more about how to design an Energy Efficient Home, I spent much of my time on the internet to see just what is out there right now that could be incorporated into a new Model for Residential Houses. So, most of this information is not mine – but freely available to anyone who wants to conduct their own research. I put much of what I found here just to save you the time to do your own homework – but at least it will give you a few ideas and you can then do your own further investigation. Larger Kitchens with more cabinet space, walk-in pantries, Energy Star appliances and features like island cooking designs, microwave drawers, double wide refrigerator / freezer spaces, effective ventilation systems etc. Much larger Master Bathrooms with glass shower enclosures, whirlpool tubs, plenty of storage space, luxury vanities, etc. More Open Space Plan designs with less interior walls, cramped hallways, and tiny bedrooms. Today’s buyers are looking for open space plans particularly in the Kitchen and Family spaces that encourage social interaction and “family time” which is becoming more valuable as many families have two wage earners now. Larger Garages with Work Shop space and areas where Dad can find some space of his own and kids can learn some skills that pertain to life not taught in today’s schools like making your own clothes or building your own car. Outdoor Decks for enjoying nature, relaxing, reading a book, or supervising children’s outdoor play activities. Green Energy HVAC, Water Heating, Solar Power, and other utility systems that are largely maintenance free and offer a degree of “free energy” after a pay - back period within 6 – 10 years. Most, if not ALL of these features are just not present in older homes today without incurring a huge renovation bill. Many younger buyers will want them and will be attracted to them because they are included in the financing of their new home. Here is a list of points that this market needs to address to be successful. Offer new buyers a new Model of a Family Residence. Offer them the best combination of Energy Saving features built into the price of the home. These are then financed from the beginning of the purchase process. Offer to help them benefit from all tax and government subsidies available to them. Educate new buyers on the pay – back period that new energy solutions offer today. Create a portfolio of different designs and square foot Models. Joint venture with other green energy suppliers to create turn – key packaged systems with better prices and combined tech support programs. 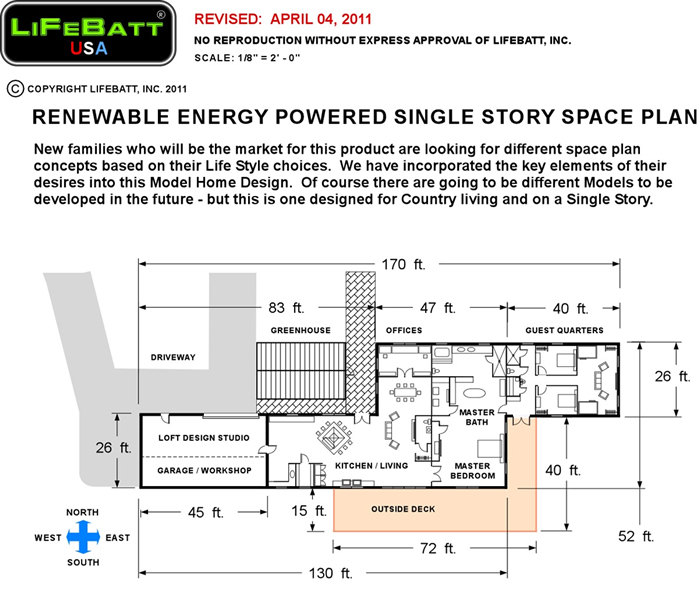 I will show a Design @ the end of this article that will perhaps become our own new home this next year? It will give you some idea of what I have described above in Plans and elevations. It may not be your idea of a new home, but we will develop different Models in the future and as we get close to realizing our goals I will publish another article outlining all the Actual Costs involved in building this new Model. But first here is the basic research I wanted to share with you that I found on the internet. How much electricity costs, and how they charge you? What the heck is a kilowatt hour? Before we see how much electricity costs, we have to understand how it's measured. When you buy gas they charge you by the gallon. When you buy electricity they charge you by the kilowatt-hour (kWh). When you use 1000 watts for 1 hour, that's a kilowatt-hour. For example, let's say you leave a 100-watt bulb running continuously (730 hours a month), and you're paying 15¢/kWh. Your cost to run the bulb all month is 100 x 730 ÷ 1000 x 15¢ = $10.95. You can't always trust the wattage printed on the device, because many devices don't use the full listed wattage all the time. For example, the compressor in a refrigerator doesn't run constantly, only sometimes, so you can't go by the listed wattage for a fridge. The most accurate way to find the average wattage of a device is to measure it with a watt-hour meter. Exercise #1. Go get your electricity bill and see how many kilowatt hours you used last month. Also find how much you're paying per kilowatt hour. Exercise #2. Assume that the lights in your kitchen and living room together use 400 watts. How much does it cost if the lights are on 24 hours a day, for a whole month? How much per year? Assume 15¢/kWh. Exercise #3. Assume your window AC uses 1440 watts. How much does it cost to run it continuously for a month? How much per year? Assume 15¢/kWh. Watts is the rate of use at this instant. Watt-hours are the total energy used over time. "You say that some device uses 100 watts. What period of time is that for?" "The speedometer in my car says I'm going 35 miles an hour. What period of time is that for?" It's not for any period of time. You're going 35 miles an hour at that instant. We use watt-hours to see how much electricity we actually used over a period of time. So, just multiply the watts times the hours used to get the watt-hours. (Then divide by 1000 to get the kilowatt-hours, which are how your utility charges you.) Example: 100-watt bulb x 2 hours ÷ 1000 = 0.2 kWh. On a peak day in 1999, California used 50,743,000 kilowatt-hours. Wikipedia has a list of electricity rates around the world. Despite whining from American consumers, the U.S. has some of the lowest electricity rates in the world (just like with tax rates). At least this has been true in the past – but things are changing fast! How much does electricity cost? The cost of electricity depends on where you live, how much you use, and possibly when you use it. The electric company measures how much electricity you use in kilowatt-hours, abbreviated kWh. Your bill might have multiple charges per kWh (e.g., this one has six different per-kWh charges) and you have to add them all up to get the total cost per kWh. Electricity rates vary widely. I found rates ranging from 12¢ to 50¢ per kWh from the same provider. The only way to know what you're actually paying is to check your bill carefully. You can't find out your own kWh rate by reading this web page, or any other. In this article, I generally use a sample rate of 15¢ per kWh. This isn't a "typical" rate, since there's no such thing as typical when it comes to electricity rates. And it's certainly not average. It's just a reasonable example. Your own rate could be dramatically higher or lower than this. Because savings happen at the highest-billed tier, those writing about saving electricity generally should not use the average rate, since the savings rate will usually be higher. That's why I use a sample rate 15¢, instead of the average rate of 12¢. According to mechanical engineers at the University of Wisconsin’s Solar Energy Laboratory, an average four-person household with an electric water heater needs about 6,400 kilowatt hours of electricity per year to heat their water. Assuming the electricity is generated by a typical power plant with an efficiency of around 30 percent, it means that the average electric water heater is responsible for about eight tons of carbon dioxide (CO2) annually, which is almost double that emitted by a typical modern automobile. The same family of four using either a natural gas or oil-fired water heater will contribute about two tons of CO2 emissions annually in heating their water. Surprising as it may seem, analysts believe that the annual total CO2 produced by residential water heaters throughout North America is roughly equal to that produced by all of the cars and light trucks driving around the continent. Another way of looking at it is: If half of all households used solar water heaters, the reduction in CO2 emissions would be the same as doubling the fuel-efficiency of all cars. Heating water accounts for up to 30 percent of the average home's energy budget. Some makers of gas-fired tankless water heaters claim their products can cut your energy costs up to half over regular storage heaters. So is it time to switch? Probably not. Gas tankless water heaters, which use high-powered burners to quickly heat water as it runs through a heat exchanger, were 22 percent more energy efficient on average than the gas-fired storage-tank models in our tests. That translates into a savings of around $70 to $80 per year, based on 2008 national energy costs. But because they cost much more than storage water heaters, it can take up to 22 years to break even—longer than the 20-year life of many models. Moreover, our online poll of 1,200 readers revealed wide variations in installation costs, energy savings, and satisfaction. With the help of an outside lab, we pitted Takagi and Noritz gas-fired tankless water heaters against three storage water heaters. We didn't test electric tankless heaters because many can't deliver hot water fast enough to replace a conventional water heater if ground­water is cold. Even in areas with warm groundwater, most homeowners would need to upgrade their electrical service to power a whole-house tankless model. Our tests simulated daily use of 76 to 78 gallons of hot water. That's the equivalent of taking three showers, washing one laundry load, running the dishwasher once (six cycles), and turning on the faucet nine times, for a total of 19 draws. While that's considered heavy use compared with the standard Department of Energy test, we think it more accurately represents an average family's habits. We also ran more than 45,000 gallons of very hard water through a tanked model and a Rinnai tankless model to simulate about 11 years of regular use. Manufacturers of tankless water heaters are fond of touting their products' ability to provide an endless amount of hot water. But inconsistent water temperatures were a common complaint among our poll respondents. When you turn on the faucet, tankless models feed in some cold water to gauge how big a temperature rise is needed. If there's cool water lingering in your pipes, you'll receive a momentary "cold-water sandwich" between the old and new hot water. And a tankless water heater's burner might not ignite when you try to get just a trickle of hot water for, say, shaving. Nor do tankless water heaters deliver hot water instantaneously. It takes time to heat the water to the target temperature, and just like storage water heaters, any cold water in the pipes needs to be pushed out. And tankless models' electric controls mean you'll also lose hot water during a power outage. The tankless water heaters we tested cost $800 to $1,150, compared with $300 to $480 for the regular storage-tank types. Tankless models need electrical outlets for their fan and electronics, upgraded gas pipes, and a new ventilation system. That can bring average installation costs to $1,200, compared with $300 for storage-tank models. During our long-term testing, an indicator on the tankless model warned of scale buildup. We paid $334 for special valves and a plumber to flush out the water heater with vinegar. Many industry pros recommend that tankless models be serviced once a year by a qualified technician. Calcium buildup can decrease efficiency, restrict water flow, and damage tankless models. Experts suggest installing a water softener if your water hardness is above 11 grains per gallon. Ignoring this advice can shorten your warranty. We also tested the $1,400 Vertex, a high-efficiency storage water heater by A.O. Smith. The manufacturer claims its installation costs are similar to a regular storage model. But its high cost offsets much of the roughly $70 per year the Vertex will save you. Instead, we recommend buying a conventional storage water heater with a 9- or 12-year warranty. In previous tests, we found that those models generally had thicker insulation, bigger burners or larger heating elements, and better corrosion-fighting metal rods called anodes. Does a tankless water heater make more sense than a solar water heater? We don’t think so. Every gallon of hot water you use still has to be heated. And the amount of energy required to heat a gallon of water to a certain temperature does not change just because it is being heated at a faster rate. The tankless water heater only eliminates energy costs for maintaining the temperature of water that has been heated and is sitting in the storage tank awaiting use. So a tankless water heater saves about 15 percent of the heating energy needed by a conventionally insulated electric or gas water heater. Solar storage tanks have extra insulation, to keep water heated during the day hot overnight, so you get the same temperature maintenance savings with solar. Most tankless water heaters use natural gas, which is currently about 32 percent cheaper than electricity for water heating. But natural gas is a fossil fuel, so it is subject to the same climate change concerns and cost inflation pressures as power plant-supplied electricity. Solar energy is clean, inexhaustible and free, so it’s “greener” than gas and beats the economics of a gas tankless water heater hands down. And one final point: Tankless water heaters can fall short on performance during periods of high demand; for example, if you are showering while the dishwasher or clothes washer are filling, or if more than one shower is in use at the same time. Of course, you could overcome this problem by installing multiple tankless water heaters. On the other hand, tankless water heaters cost much more than conventional water heaters to install, so the total installation cost for more than one tankless water heater can quickly surpass the cost of a single solar water heating system. Why not just install a solar water heater? Solar water heaters provide all the benefits of tankless water heaters but eliminate up to 90 percent of your water heating costs. Having half of all households use solar water heaters might not be such a tall order. According to the Environmental and Energy Study Institute (EESI), there are 1.5 million solar water heaters already in use in U.S. homes and businesses. Solar water heater systems can work in any climate and EESI estimates that 40 percent of all U.S. homes have sufficient access to sunlight such that 29 million additional solar water heaters could be installed right now. Another great reason to switch to a solar water heater is financial. According to the EESI, residential solar water heater systems cost between $1,500 and $3,500, compared to $150 to $450 for electric and gas heaters. With savings in electricity or natural gas, solar water heaters pay for themselves within four to eight years. And solar water heaters last between 15 and 40 years--the same as conventional systems--so after that initial payback period is up, zero energy cost essentially means having free hot water for years to come. What’s more, in 2005 the U.S. began offering homeowners tax credits of up to 30 percent (capped at $2,000) of the cost of installing a solar water heater. The credit is not available for swimming pool or hot tub heaters, and the system must be certified by the Solar Rating and Certification Corporation. HVAC – The best solution out there, besides in-ground Geothermal, is the one I personally like because it is easy to install and has fantastic efficiency. The most common type of heat pump is the air-source heat pump, which transfers heat between your house and the outside air. If you heat with electricity, a heat pump can trim the amount of electricity you use for heating by as much as 30%–40%. High-efficiency heat pumps also dehumidify better than standard central air conditioners, resulting in less energy usage and more cooling comfort in summer months. However, the efficiency of most air-source heat pumps as a heat source drops dramatically at low temperatures, generally making them unsuitable for cold climates, although there are systems that can overcome that problem. Higher efficiencies are achieved with geothermal (ground-source or water-source) heat pumps, which transfer heat between your house and the ground or a nearby water source. Although they cost more to install, geothermal heat pumps have low operating costs because they take advantage of relatively constant ground or water temperatures. However, the installation depends on the size of your lot, the subsoil and landscape. Ground-source or water-source heat pumps can be used in more extreme climatic conditions than air-source heat pumps, and customer satisfaction with the systems is very high. 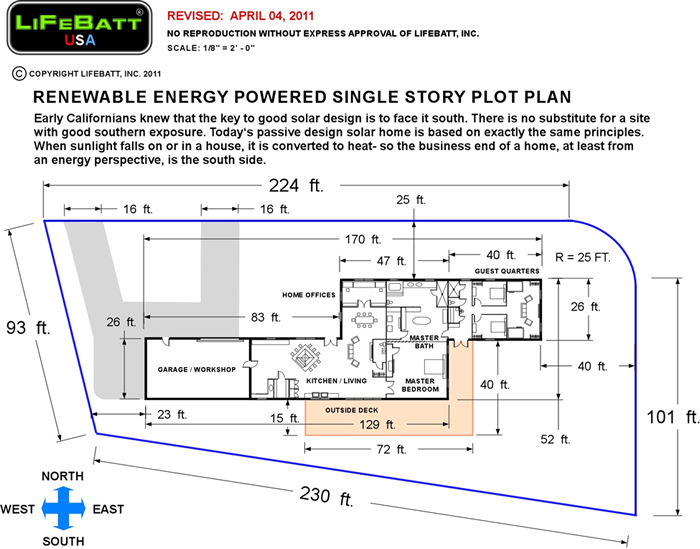 Powering your New House Using New Solar Building Materials. Solar panels give off no pollution; the only pollution produced as a result of solar panels is the manufacturing of these devices in factories, transportation of the goods, and installation. The production of energy from the use of fossil and some renewable fuels (e.g. wind turbines) can be noisy, yet solar energy produces electricity very quietly. One of the great pros of solar energy is the ability to harness electricity in remote locations that are not linked to a national grid. A prime example of this is in space, where satellites are powered by high efficiency solar cells. The installation of solar panels in remote locations is usually much more cost effective than laying the required high voltage wires. Solar energy can be very efficient in a large area of the globe, and new technologies allow for a more efficient energy production on overcast/dull days. Solar panels can be installed on top of many rooftops, which eliminate the problem of finding the required space for solar panel placement. Another great pro of solar energy is the cost. Although the initial investment of solar cells may be high, once installed, they provide a free source of electricity, which will pay off over the coming years. The use of solar energy to produce electricity allows the user to become less dependent on the worlds fossil fuel supplies. The major con of solar energy is the initial cost of solar cells. Currently, prices of highly efficient solar cells can be above $1000, and some households may need more than one. This makes the initial installation of solar panels very costly. Solar energy is only able to generate electricity during daylight hours. This means for around half of each day, solar panels are not producing energy for your home. The weather can affect the efficiency of solar cells. Pollution can be a con of solar energy, as pollution levels can affect a solar cells efficiency, this would be a major con for businesses or industry wishing to install solar panels in heavily polluted areas, such as cities. Above is a list of many solar energy pros and cons, and although not definitive, you can see how the number of pros relating to solar energy, greatly outweighs the cons of solar energy. The main reason we are not seeing a large amount of solar energy technology installations is due to cost, but now, as the price of fossil fuels continues to climb initial investment towards the currently available solar panels, we could see a massive shift towards solar electricity production. In architecture, passive solar energy is harnessed using building orientation, solar mass, glazing, etc., using building techniques that have existed since the beginning of building. With the growing popularity of sustainable practices and the awareness of the precarious state of our environment, people it seems are finally starting to take notice of these common sense approaches and it is has increasingly become fashionable to be sustainable. This demand should fuel a greater need for cheap solar technology which will in turn drive innovation. Passive solar energy design is one the smartest ways to obviate a building’s energy needs and to keep the needs of the building down over its lifecycle. Instead of building a traditional stick frame house we are looking at the SIPS approach which has many advantages over conventional frame (stick) built houses. Structural insulated panels (SIPs) are high performance building panels used in floors, walls, and roofs for residential and light commercial buildings. The panels are typically made by sandwiching a core of rigid foam plastic insulation between two structural skins of oriented strand board (OSB). Other skin material can be used for specific purposes. SIPs are manufactured under factory controlled conditions and can be custom designed for each home. 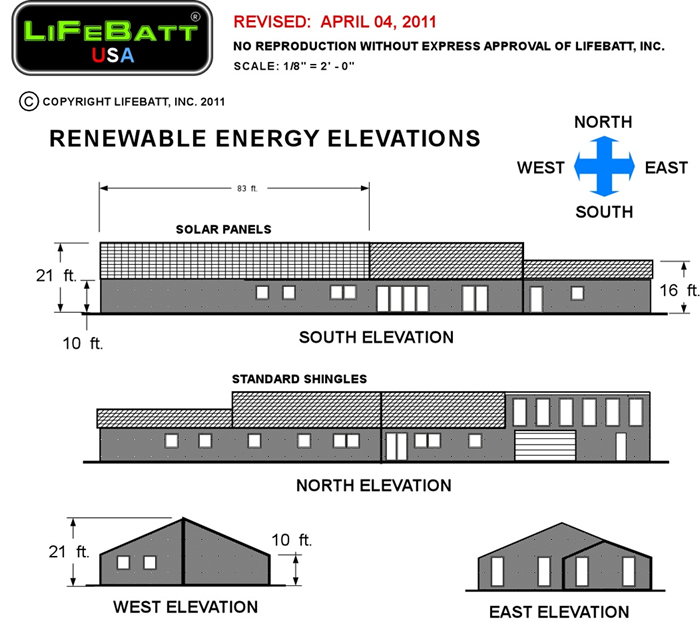 The result is a building system that is extremely strong, energy efficient and cost effective. Building with SIPs will save you time, money and labor. Are Structural Insulated Panels More Expensive? Building with SIPs generally costs about the same as building with wood frame construction, when you factor in the labor savings resulting from shorter construction time and less job-site waste. Other savings are realized because less expensive heating and cooling systems are required with SIPs construction. How about Precast Concrete Panels? Concrete sandwich panels are highly engineered to provide rugged, durable surfaces for walls and can be used for floors, as well. Precast concrete panels (and other items) are manufactured in factory settings. Not only is this conducive to improved quality control, it’s also possible to manufacture year round during any type of weather. By designing buildings to have one predominant panel size, panel manufacturing becomes a repetitive process and gains efficiency. Following a two-step casting process, the resulting void between panels can be filled with insulation. Precast construction. The ability to quickly erect panels at the site is another advantage of precast. Once footings are prepared, panels can be placed quickly to form the enclosure. 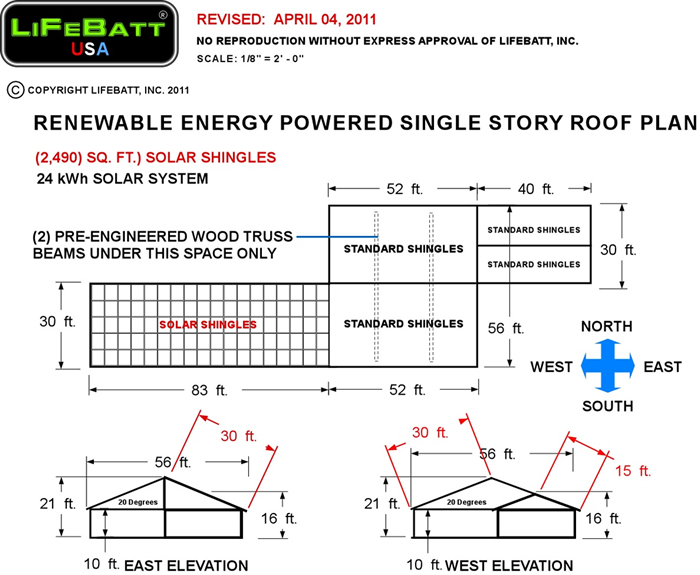 This requires some lead time to order the panels, but is an advantage at the site. It also means that construction can be completed within a relatively small footprint and may allow building in weather that would negatively affect other types of construction. Solid, high-quality concrete construction built with an efficient use of labor makes for cost effective structures. Precast, like all concrete construction, provides fire, rot, termite, and mold resistance. Exterior walls can withstand tornado-force winds. It is solid construction that protects occupants from weather and from natural disasters. Architectural finishes for precast are varied. Concrete can be integrally colored with mineral pigments. The range of colors is quite wide if white cement is used. One of the most common surface treatments is exposed aggregate. Form faces can be treated with surface retarders prior to casting, or, following hardening, the surface of the concrete can be textured with abrasive or water blasting. Exposed aggregate finishes are usually sealed to provide added resistance to water penetration. Alternately, panels may be cast with a form liner and painted with masonry-type paint. This allows the simulation of many other finishes such as hand laid masonry (brick or stone). Some people prefer casting a thin brick or concrete unit into the face of the panel. Still others prefer attaching the finish at the site to create either a cavity wall or a barrier wall. Portland cement plaster is also a suitable finish for precast, and can be directly applied to panel faces. Interior finishes may be given the same treatment as exterior faces, or may receive a direct application of plaster or paint, or they can be finished with drywall for a more conventional appearance. From a performance perspective, the system creates an energy efficient envelope. Precast panels are erected on site and joined together. The size of panels dictates joint spacing, but often the number of joints is reduced over other types of construction, which helps create tight building envelopes. This protects against unwanted air losses and may even require that air changes be provided. It is common to downsize HVAC equipment and increase mechanical ventilation in precast concrete buildings. Insulated precast panels may reduce energy consumption by 20% to 30% in smaller buildings. This is because the panels are so energy efficient, having insulation combined with the thermal mass of concrete. A related benefit of mass walls is that they are great for soundproofing. Next-door neighbors may like it warmer or cooler, louder or quieter than each other, but the insulated concrete panels means they can both have it just the way they like it. Depending on the location of manufacturing relative to the project site, precast may also contribute to local materials credits in some green building rating systems. Most concrete materials are locally sourced. Also, precast producers are located throughout North America, and it is common to source the panels from a relatively close producer to minimize the time and expense of shipping. Whether they think of it as “building green” or “sustainability,” today’s consumers expect homes and other low-rise structures to have minimal environmental impact yet meet or exceed their lifestyle needs. They want properties offering comfort and security with low energy bills and low maintenance. They also demand healthy interiors that promote wellbeing. And they want all of this in an attractive package. Understanding these common terms will help you select the right windows and doors. U-factor — this measures the rate of heat loss and how well a product insulates. The lower the number, the better a product is at keeping heat inside a building. The U-factor is key in the winter months, and important to consider in choosing a window. Solar Heat Gain Coefficient (SHGC) — this measures how well a product blocks heat from the sun. The lower the number, the better. In southern climates or high sun intensity areas, you might actually want to keep the sun’s heat out of your house. Windows can help do that. R-value — this measures resistance to heat loss. Many people are familiar with the R-value because of its use in home insulation. But actually, for windows and doors, U-factor and solar heat gain coefficient are more important measurements. Design Pressure Rating — the “DP” measures the amount of pressure a door or window will withstand when closed and locked. Each DP rating also establishes other performance factors such as water penetration, air infiltration, structural pressure, forced entry and operational force. The higher the DP numbers, the better the performance. Look for the certified hallmark of the Window and Door Manufacturers Association. So, HOW to include DC in an AC Powered Home? This would be a definite issue. Have you ever had to power a guitar pedal board? Random question perhaps, but if you saw what the power strip looks like, you’d catch my drift. Every one of those little electronic devices is too small for a transformer, so they all have AC-DC converters which can power the device with a different required voltage. Now take this idea and expand it to all the doo-dads in your house. I would be willing to guess that there are at LEAST 5 different required DC voltages for all of the normal devices in a home. Conversions would be required from DC->DC instead of AC->DC. A possible solution would be to set up the wall sockets to have selectable DC output (perhaps the home runs on 100V DC and each socket can convert this down to 24V, 12V, 5V, 3V). One of the most popular notions in renewable energy today is the idea of selling your excess power back to the power company, hopefully at a decent rate. Then when your device is not outputting power, you simply switch to grid power and start buying it from the power company. This is great because it does not require battery systems. And while this exercise excludes that option (for people living in the middle of nowhere or with unaccommodating power companies), it would be nice to sell any excess power back to make a small profit. This is possibly one of the biggest problems that an all DC power system would face: No one does it yet! All parts would have to be custom made and you couldn’t just call an electrician to come out and fix your stuff. Government regulation would also limit any kind of large scale implementation of DC power sockets. It is almost guaranteed that it would require government certifications on many levels to allow manufacturing large enough quantities to bring the cost down for Mr. John Q Everyman. Motors are the first kind that comes to mind. This is basically how Nikola Tesla got started onto AC, proving that it is much more efficient when using AC than DC AND that these motors do not rely on voltage level (DC motors’ speed can be controlled by the voltage applied). This would mean you would either have to convert your DC back to AC to run the vacuum cleaner or you would have to make sure that your DC could supply constant DC and the whopping currents that those kinds of devices use. You know that big garbage can looking things that are attached to power line poles? Those are changing the ridiculously high voltages in the power lines (done for transmission efficiency) down to something that we can use in our houses. Further, these are VERY high efficiency devices. For power in general, you really can’t beat AC-AC conversion; the system proposed here would have to use transistors (note: not transformers) which will have some amount of heat loss associated with them. So even though we wouldn’t be using the AC power from the power company, we would be losing a critical tool in the electrician/electrical engineers’ arsenal, the transformer. No transistor is perfect; they all let just a little bit of current through. The more components in a system or the higher voltage you run at, the more leakage you will tend to have (Ever wonder why electronic devices run out of batteries eventually, even if you don’t use them for a long time?). This would apply to any DC system too and when you don’t have the lights on or anything running, there’s still a chance that the power devices are leaking. This will cut into overall efficiency. Higher efficiencies off of battery power – this is where the Solar Roof + Battery Storage comes into play. We propose using BOTH AC & DC wiring right now. I’m sure most of you know what this sounds like from a faulty light switch, an older device with poor power supplies or even by sticking a fork in the wall. The native frequency of power coming out of the wall is 60Hz in the US, but varies by region. Either way, this is something that I’ve had to deal with at my job and that all electronics designs have to deal with. With an all DC system there would be other issues such as power filtering and voltage stability… no hum though! As devices continue to get smaller, the power supplies are reaching a lower limit. 1.8V is currently the lower end of DC supplies for microchips. This allows for less power consumption, as is governed by the formula P = V² * f * C (where P = power, V = voltage, F = frequency and C = capacitance). Have you ever noticed how they stopped increasing the frequency of microchips past a certain point (~3.5 GHz)? Yeah, it was because they started getting so hot you could fry eggs on the processors. Plus mobile processors became much more prevalent. As more and more devices go towards these lower voltages, there will be less need for conversion (or alternately, more need for AC-DC converters if wall power remains as AC). So the final question comes back to that posed by the giants of the 19th century: AC or DC power? Well, really the answer will be both, as history has shown. Perhaps over time we’ll see a shift back towards DC power as devices continue to shrink and manufacturers don’t want to include bulky transformers or as people hopefully begin producing their own Solar Power at home. In cold and temperate climates, long rectangular buildings, with their longer walls facing the winter sun are excellent solutions in terms of energy efficiency. Well oriented home, with a proper shape and properly placed windows can cut your energy bills by 30 percent or more. We shouldn’t forget the very basics about the sun’s path in the sky: sun rises in the east and sets in the west and is higher in the summer sky and lower in winter. These basic facts, and the several particulars of each site and climate, should be taken into account when building a new home. In hot climates (either humid or dry) with no winter heating needs, orientation should exclude sun exposure, and look for exposure to cooling breezes. In temperate and cold climates, if you live in the north hemisphere, the longer walls of your home should face south (the north, in southern hemisphere countries). Southern exposure is crucial to get maximum solar benefits (Northern exposure in Southern hemisphere countries). This rule shouldn't be considered too strictly. A variation till 20 or 30 degrees is rather irrelevant, and there are particulars and adaptations that should also be considered. Rectangular-compact buildings, with their longer walls facing the winter low sun (to profit from it), are excellent solutions. In this case, the longer axis of the building (its ridge line) is oriented east/west. Such orientation and shape allow maximum winter solar gains and will reduce unwanted summer sun (that will strike the east and the west sides of the house). The most used areas of the house should be located on the winter side of the building (cold and temperate climates), where sunlight can enter through conveniently located windows, high clerestories windows, or skylights. South-exposure should incorporate well sized overhangs and the shadow of trees, to limit sun radiation in the hotter months. 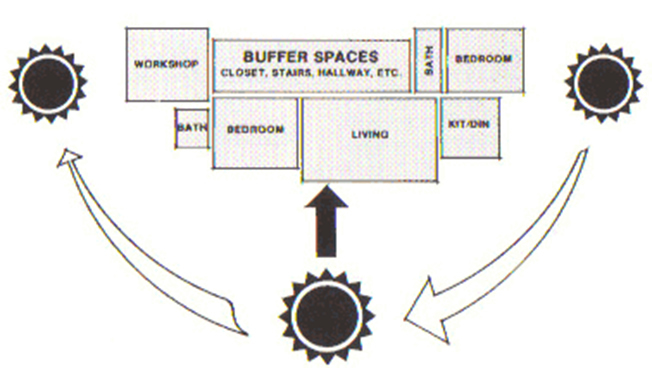 Other rooms and divisions (namely garages, storage rooms, laundry rooms...) should be located on the home's east/west and shorter sides, where they can act as an extra thermal buffer. Avoid glass in the east and west sides of the house, since it is a common cause of unwanted energy losses and glare. Landscape features such as trees, hills or the predominant orientation of the winds are also crucial in your home’s energy needs. You should study the prevailing winds and their patterns in order to use windbreaks or walls to direct breezes into the house or to channel cold winter winds away from it. In the summer, when the sun is higher in the sky, trees with adequate tree-top can help to shade the building and keep it cooler. I welcome any and all comments on these ideas and if you know of something being developed similarly, please let me know!